Amazon's Blu-ray deal this week is for the ultimate Civil War buff! 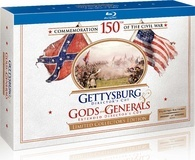 The online retailer is now selling 'Gettysburg / Gods and Generals: Limited Collector's Edition' for $36.49 (57% off suggested retail price). This set includes the Director’s Cut version of both films, hours of rich and insightful bonus content, photo book of Civil War artifacts, 32-Page booklet extracted from TIME The Civil War: An Illustrated History, Historical Battlefield Map and Commemorative Coin. Click here to save nearly sixty percent and this offer is available now through January 21.